Doctor’s certificates are required for lots of different types of permits (like a driver’s licence), and that is why there are many places where you can get them from. Just Google the term “certificados medicos” or “reconocimientos medicos”, and you will find the nearest one. They are usually strategically located near government buildings, especially near the department of motor vehicles, which in Spain is called “Direccion General de Tráfico”. These are set up in such a way, that the waiting time is hardly a few minutes. You will quickly pass through all the different departments, where they check your eyes, ears, heart, etc., and you can be out within 20 minutes. Rates are reasonable, so that everyone renewing a permit, can afford them (40-50 euros). For spearfishing in Gran Canaria, local doctors will pay special attention to your lungs and heart. If you want to order your licence online, you will need to send us the original doctor’s certificate. This has to be issued by a Spanish doctor, and must clearly state that you’re perfectly fit to practice this sport. Certificates issued in other languages won’t do. Once we receive the certificate, we will take care of the rest, and send you the licence by e-mail. All you have to do, is to print it out on your side, and you’re ready to fish. We will also send you the local government fishing manual, which shows you the designated areas for this type of sport. Our fees for this type of licence are 50 euros. The application will be processed in a day, after the doctor’s certificate, passport or ID copy, and payment, are received. If you’re interested in ordering this type of licence, please contact us, before going for the check-up. We will guide you, about what must be written on the doctor’s certificate. Spearfishing licences are valid for 3 years, from the date of issue, and allow you to fish all around Spain, except Andalucia, in the designated spearfishing areas. 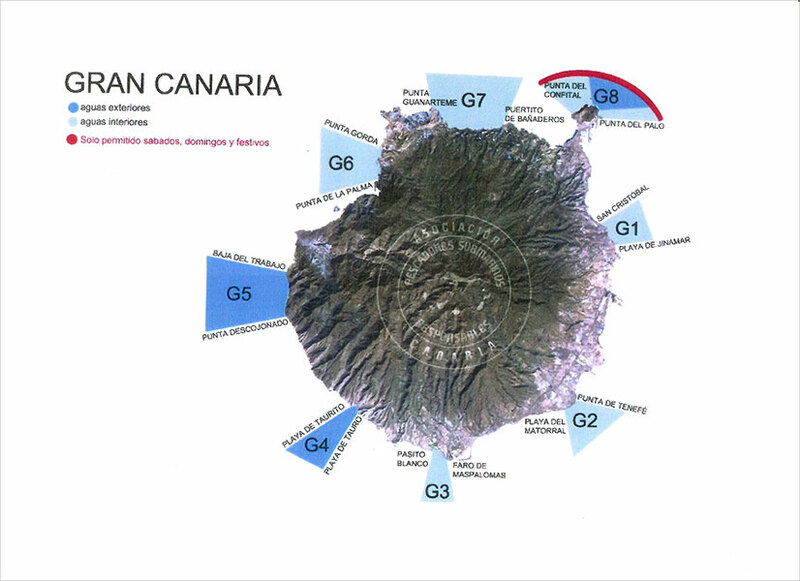 Here below, you can see the Gran Canaria spearfishing map. You're only allowed to practice this sport, during the day, i.e. from sunrise, to sunset. The dark blue areas are known as "exterior waters" and you can fish up to 4kgs of fish that have to be above the minimum size, unless the first fish you pick is over that weight. The light blue areas are known as "interior water" and you're allowed 5kgs there. In the area marked as "G8" you're only allowed to fish on weekends and holidays. Copyright Gran-canaria-beaches.com 2011-2019 -Powered by Solo Build It!